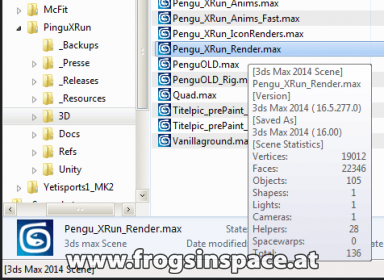 While working with 3ds Max scenefiles ( *.max ) in windows explorer, information about the file’s content without launching 3ds Max is not accessable. 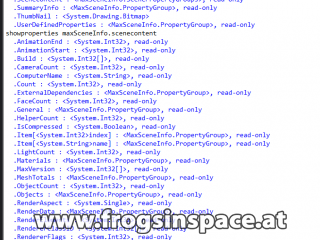 3ds Max files are blackboxed binary files, using an internal, undocumented data structure. One has to launch 3ds Max and load the file in question to have a peek on its content. And god forbit you do not even happen to have 3ds Max installed and still have to deal with those pesky 3ds Max files ! Because of the limits described above, i started a rather large coding project some time ago. 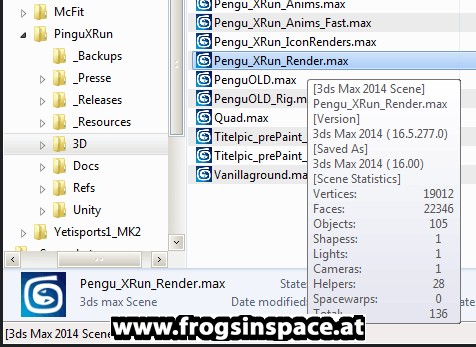 The goal was to expose as much info about 3ds Max file’s content inside Windows Explorer as possible. This project turned out to consist of two seperate parts. The essential part is the MaxSceneInfo core library, which does all the file analysis and data reading and provides an easy to use API for third parties to hook into and make use of it’s functionality. This core library is provided as dotNet assembly written in C++/Cli. This way C#,C++,VB.Net and even Maxscript coders will be able to directly use the API without much effort. 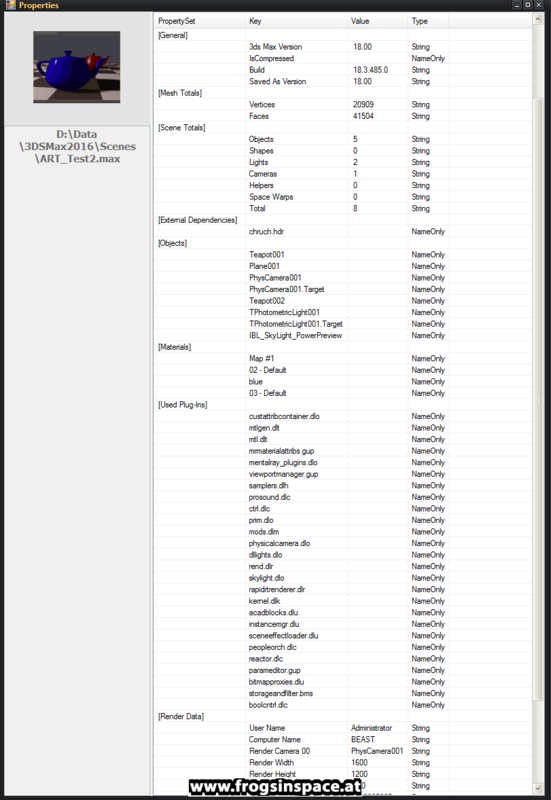 Here is a screenshot of a small test application making use of the library. 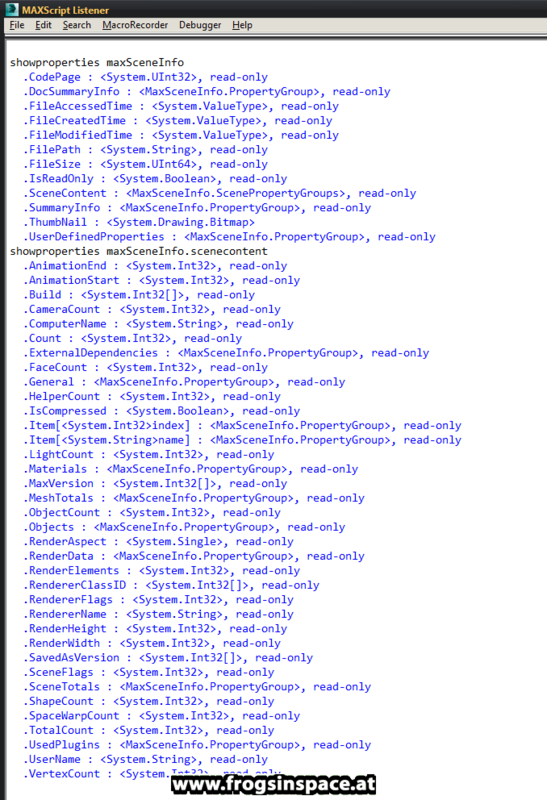 The second screenshot shows some of the properties exposed to Maxscript (via MXS/dotNET). Currently there’s the functional and working core library (but still unfinished and growing featurewise). On the Explorer integration side the property panel, tooltips and thumbnail are currently in progress and working to the largest part. 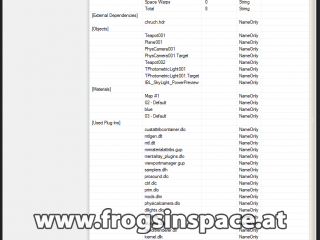 Here are some screenshots of the file property panel and the tooltip for 3ds Max files. As said, this is a bigger project, demanding quite some time and commitment by myself to really pull this through. But i’m convinced that such a tight Explorer integration for 3ds Max files would provide tremendous help for people dealing with 3ds Max files on a regular basis. If you agree with that and want to support this development project in any form, please contact me directly via my email adress spacefrog@chello.at. I consider putting some paypal donation link online for this project later on, but support in this early stage would help to bring the whole project on a more stable foundation.